Shawn Borri runs the North American Phonograph Company where he performs acoustical recordings on cylinders and lectures on phonographic history. The company also manufactures and sells cylinder blanks. For the recordings, Shawn normally uses an unaltered Edison phonograph, but he has also fitted an Edison Standard B with a Fairchild 199 electric cutting head. It needs some 30 W of power in, and to match the 2 ohms impedance, Shawn has connected a loudspeaker in series. The cutting head is capable of rendering 20 - 20,000 Hz, and for recording on cylinders the midrange and bass will have to be reduced. 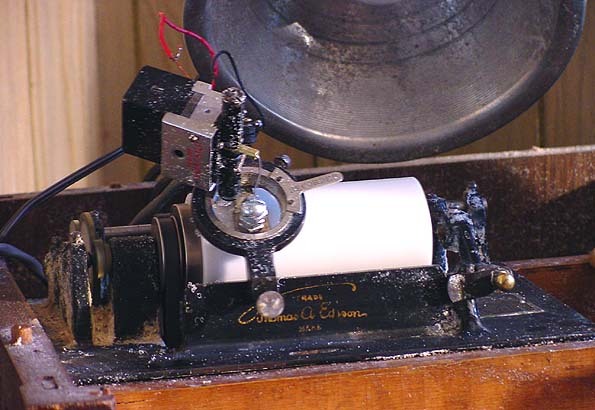 This recorder has been used mainly to make cylinder copies from the North American Phonograph Company catalogue.